Holidays are a highly anticipated matter for most children around the world, including Russia. Just like other countries, Russia has several days off in a year. Starting from the state day such as the day of victory in Russia, labor day in Russia, to religious holidays. Russia also has a summer holiday so that all Russians can enjoy the summer which is the favorite season in the country. Russians have typical activities during the summer in Russia, which of course is not done in other seasons. Vacation is the right moment for children to visit the playground with family. Inviting children to a recreational park is a good idea. Children can try various fun games. Starting from adventure in a haunted house, roller coaster, and many more. These games will of course relieve stress for children. So they will be ready and fresh to start school activities again after the holiday is over. This is one of the most useful holiday activities. Inviting children to exercise will nourish their body and soul. This is one of the effects of the 2018 world cup in Russia. Many Russian children now have a new hobby, soccer. Many football clubs for kids are crowded during school holidays. For Russian children who like sports, of course they will spend their holidays playing football. They will even make a football match until the holidays over. Maybe now children have rarely done this activity during the holidays. 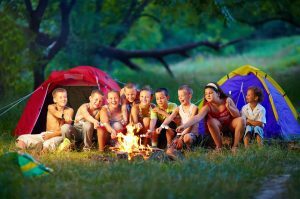 But Russian children who live in the village still often do camping with their friends. They walked through the forest and gardens by walking with a group of friends, then set up tents and spent the night there. These children also make bonfires to warm the night. To be safe, this adventure is usually accompanied by an adult to lead it. We know that cooking in Russia is something Russian women can do. Russian girls usually spend vacation time cooking with their mothers. Their mothers will train their children to cook every day. Usually this cooking activity is carried out by Russian girls who have started to grow up. The mothers teach various recipes, from the simplest to the least complex, depending on the enthusiasm of the child. Watching movies is one of the fun children’s holiday activities. Usually children have a hobby of watching movies because their parents also have the same hobby. Parents, even children, will prepare various films to watch in holidays. They will not watch movies in theaters every day, but watch movies at home. This activity includes very simple activities so that the child stays calm inside the house while on holidays. If the film is very popular, they will invite friends to watch together at home. There are children who like to watch movies, there are also those who like to read. Basically every child has their own hobbies when holidays. If the child likes to read, they may have rented or collected many comics to deliberately read during school holidays. Of course, holidays is the best time to read comics, because when they go to school they will only read textbooks. This holiday activity allows parents to watch their children at home at any time. The activities of this one child are actually practiced almost every day by children. Especially if they already have their own gadget. Parents will scold children for playing games during school days. But they will be free to play games while on vacation. That’s why playing games is one of the holiday activities that are very much loved by children, including children in Russia. They can play games with their mobile phones, play stations, and computers. Visiting your grandmother while on vacation, may be a classic thing. But believe me, this is still very fun for children. Especially children who live in areas far from their grandmother’s house. Children from the city usually visit their grandmother in the village. They will get a lot of things. Starting from learning culture in the village, adventure at the grandmother’s place, and of course getting a lot of friends in the area. In addition, sending children to grandma’s place when school holidays is a relief for parents who still work in the city. There are many children’s institutions that hold camps during holidays. Children who want to add knowledge and friends can participate in this activity. Activities in it depend on the holiday season. Most of these camps are held during the summer holidays so there is a lot of outdoor activity that can be done. Camp can have a variety of time duration. From just one day to a camp that lasts until the holidays are over. Children can get to know many new friends by participating in this activity. Music courses when school holidays can be done by children who have a hobby in the arts. But many parents also include their children to take music lessons even though they do not have a passion in this field. Music trains the ability of the child’s right brain so that it can balance the brain when entering school again. Music is also able to process children’s emotions well. Usually it is parents who have an art hobby who put their children into music lessons. Those are some Activities That Russian Children Do During Holiday. Russian children’s activities when holidays is almost the same as children in other countries. This is because the changing times have made all the activities in the world similar. Summer in Russia may be the most enjoyable holiday. Because in addition to holidays, children can enjoy some Russian specialties in the summer. In addition, they can visit the beach when summer arrives. If you visit Russia in the summer, don’t forget to bring a special summer travel packing.